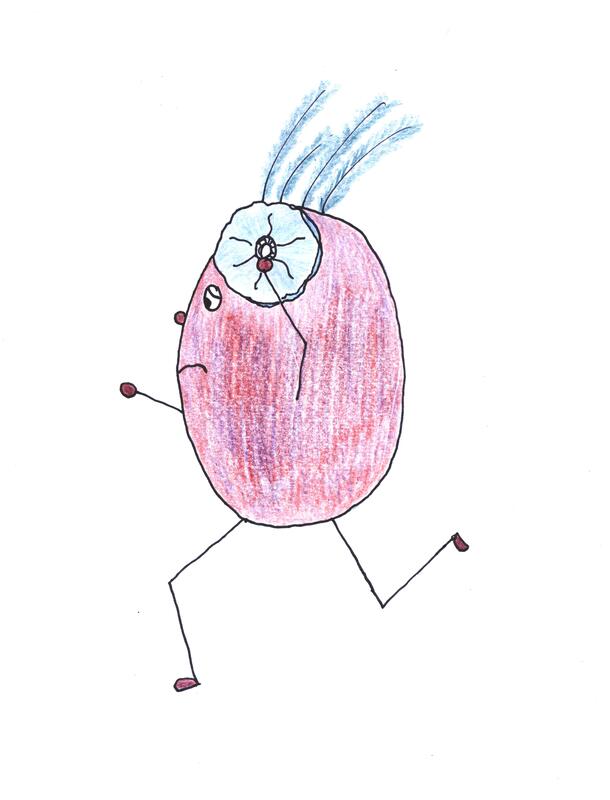 This entry was posted in Life and tagged Running, The Flying Beetroot. Bookmark the permalink. I say ditch the spreadsheet…!!! Vote #3…ditch the spreadsheet. It’s ruling (ruining) your life! Only the running part of it. See comment to Jude and then follow on to M-R (okay, la..whatever she is now) and Farmer Fi. Does that help at all? They’re right, and you know it. But I also know that their being right won’t in the end mean a bloody thing. For a reason/reasons that are unknown (? ), commitment is the all-in-all to you, and you CANNOT allow it to be damaged, let alone broken. Who would siffer if it were ? – doesn’t matter. It’s been made. Oh, I know it will never happen. But that doesn’t give me the excuse to be just as bad. In fact, it is all the more reason to do the right thing. Are you wagging your finger at me ??? You don’t mean bashing by ME ??????? I didn’t lay a finger on you. I was merely stating my opinion of your character – which is atmospheric. I’m totally out of my running zone at the moment. I got out of the habit and now it’ll be hard to go again… And it’s too hot. And But I know that when I’ve made a schedule, especially with an event in mind, I kind of feel I have to stick to it. Mostly out of terror about FAILING to complete said event. Hadn’t heard of golden tickets before – love the idea 🙂 Good luck! Oh, Fi, thank you!! I was struggling with how to respond to the “ditch the spreadsheet” votes because I couldn’t quite explain why it’s so important. But you have expressed exactly what I am feeling. I have committed to running a half-marathon for the first time. Training advice is crucial. I have that (and from a multi-marathon runner) and so not to follow it – in my mind at least – is to risk not succeeding. Wow, a half marathon! I’ve never done more than 10k. Largely because I avoid committing to them as I haven’t felt I’ve had the time! But if I did commit, I would do exactly as you are. It sounds as if you’ll be just fine, and I know it’ll give you an amazing sense of achievement. Running in the rain – onya. But running with a blinding headache?! Stroke material. Like you, I’m compulsive about my training. It’s a fear thing. I don’t want to be at the starting line feeling unprepared. What I learned however if that the spreadsheet does not have to be a cruel master … life does – and will – get in the way. It’s knowing how, and when, to rearrange the running schedule to accommodate life. If I knew Sunday was going to be a bad day for whatever reason, the long run got moved to the next logical day … in my case it was Monday. Periodically it was the preceding Friday. Or maybe a shorter run can switch plans with a longer run on days when life is intruding. A run that’s been moved to another day is still a run completed. Give each of your weekly runs a ranking in priority. For me it was my long run and speed/hill run. They were non-negotiables and other runs were sacrificed if required to accommodate them. A training program is not derailed because a short easy run was sacrificed for a long run that needed to be moved. There will be days you won’t feel good. The general rule of thumb I was taught is that if you feel sick below the neck, DON”T run. I’ve had many headaches go away BECAUSE I went for a run and I’ve never had one get worse because I did. However, If you have a cough or a sick stomach … it’s not a good plan to run. It will be wasted effort and in all probability you will feel worse afterwards. Recognize that running through pain is not good. All your training will not help you if you get to race day with an injury that prevents you from running … says the woman who missed the Disney Marathon because of a stress fracture. It was years ago and I’m still bitter. …. and there’s absolutely nothing wrong with running in the rain 🙂 … unless of course it’s a freezing rain in which case I recommend rescheduling! Sorry for the very loooong comment. That’s my 2 cents worth. If I can help in any way, please don’t hesitate to drop me an email. I’m not an expert, but I’ll be happy to share my learnings over the years of various successes and mistakes. Excellent advice from Joanne! I’m not surprised you ran in the rain….what’s a little water, right? You never know when you’re really going to need those Holy and Golden tickets. I’m impressed, H., really! Apparently. 😀 Actually, I’m not a runner by natural inclination. If I need a boost, I’m more likely to pick up a ukulele or a pencil. I’m not sure I even enjoy the process of running, but I like the fitness it gives me and that it lets me eat more chocolate. Not having a running partner, the only person who can get me out the door and down to the track is ME. It’s too easy to make excuses. Committing to the spreadsheet prevents me from doing that – it gets me out the door when I don’t feel like it. Oh I am with you! When I decided to tick a marathon off my bucket list I became obsessive with the schedule. I am not a runner so I needed that discipline to get it done. That’s why I clicked “like” on the ditch the spreadsheet comments. 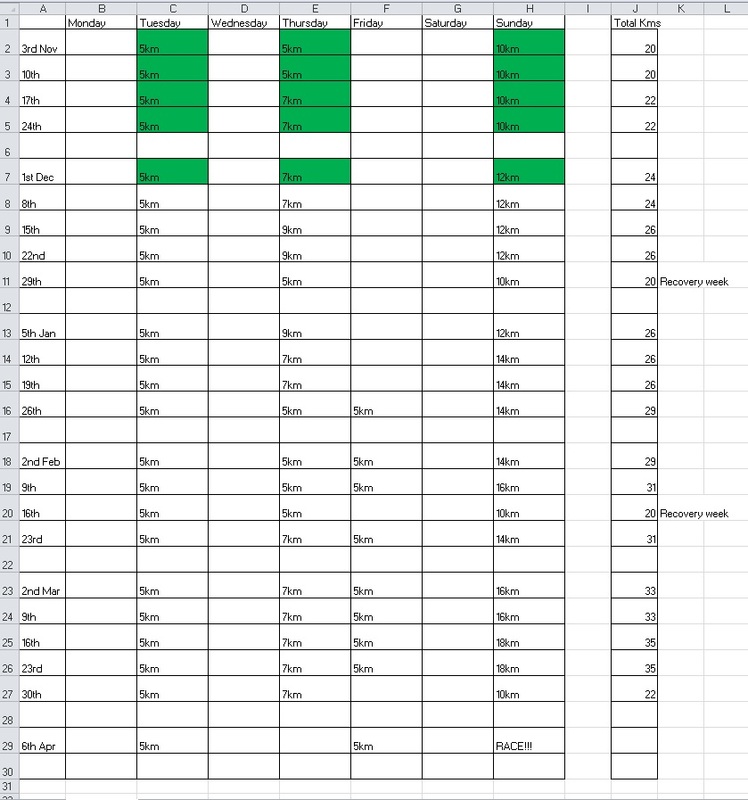 And by that, I mean ditch the need to have the spreadsheet all green. I like the idea of built in passes. Go ahead, give yourself permission. I think I can work on that. Keep the spreadsheet but let go of the monochromatic theme. 😀 Well, I’ll try, okay? That’s why I run. So I can eat more than one chocolate donut. I absolutely admire your spreadsheet dedication. If it had been me with the headache and pouring rain, I would have stayed home. You go girl! Go and jump out at her on her new blog and shout BOO!